Give us a call today at Sky Business Centres, the specialists in Workplace Recovery, where your disaster is our opportunity to help ensure your business continues to grow with confidence. For as little as €500 per year you can ensure that your business continues no matter the disaster with a place for your team to go, plug in and continue, all with as little as 3 hours notice. Allow your personnel to keep working by relocating them to a physical workplace. Fully equipped offices with I.T. equipment ready for you to use. Restore Your Business Connectivity with Phone and Data Services. *Price quoted based on per user per year. 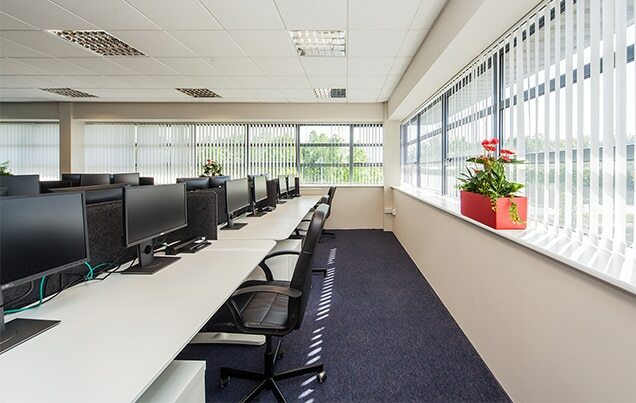 Three ideal locations to choose from for your workplace recovery office. Give your staff the comfort knowing there is a office ready and waiting in the event of a disaster. Our centres in Clonshaugh and Damastown, located at Port Tunnel Business and Technology Park and Plato Business Park respectively, have dedicated parking spaces for all companies staying with Sky Business Centres. Need a workplace recovery solution that comes to you and saves the hassle of relocating. Our mobile workplace recovery option will have your company back in action with minimal downtime. Recovery Workstations with IPT phone, Data connections and P.C’s. As well as high speed Ethernet we also offer WiFi for visiting clients. Need web hosting as part of your business continuity plan we can help you out. To save your clients and customers been kept waiting we offer an emergency receptionist to cover all calls and queries, when you can’t offer an downtime with your business. Every workstation you require will have a dedicated ISDN telephone number, which is activated all year round and can be used when redirecting calls from your original telephone number, via your telecoms provider.